The Compliance Jobs Report this week has a new compliance leader at Uber, and another departing from United Technologies. 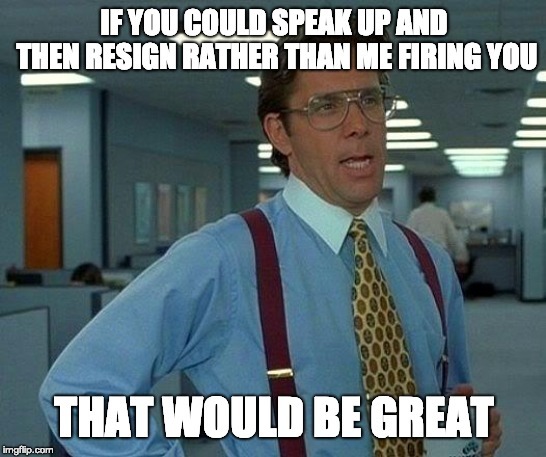 Other personnel appointments at Conifer Health, the Treasury Department, and shoe business Caleres; plus a few job openings, and our Meme of the Week goes out to all the dull managers in the world. Uber has named Dianna Jones senior counsel for global compliance. Jones comes to Uber after more than 10 years at Wood, an engineering firm. She had been regional compliance counsel for the Americas since 2014. Here’s hoping she got some pre-IPO equity as part of the package. Nora Dannehy, associate general counsel for global ethics and compliance at United Technologies since 2013, has left that role to join the U.S. attorney’s office in Connecticut. Dannehy will work as counsel to U.S. Attorney John Durham, and was herself U.S. attorney for the Nutmeg State from 2008 to 2010. Lateral move: Jennifer McClean, a quality assurance manager at the Consumer Financial Protection Bureau, has transferred to the Financial Stability Oversight Council on a six-month rotation. One presumes she will still be managing quality. In Texas, Conifer Health Solutions has promoted Jennifer Mason to chief compliance officer. Mason has been at Conifer since 2013 and had been deputy chief compliance officer for the last 18 months. IFG Companies, an insurance firm based in North Carolina, has named Michael Dandini chief risk officer. Dandini comes to IFG from Berkley FinSecure, where he was chief executive officer. Dandini will report to IFG chief executive Chris Lewis, and like all good insurance executives, he will be based in Hartford. Also in Connecticut, Torrington Savings Bank has named Alan Saxena as chief risk officer. Saxena comes to Torrington Savings from Citizens Financial Group, where he worked in the risk management function. Moving up: Lisa Flavin, chief compliance officer and head of audit at the industrial engineering firm Emerson, has been elected to the board of directors at Caleres, a shoe shoe business based in St. Louis. Flavin also serves on the board of BJC Healthcare (where she chairs the audit committee) and on the board of U.S. Chamber of Commerce. We need more compliance officers on boards. And another federal prosecutor is leaving special counsel Robert Mueller’s team. Zainab Ahmad, an assistant U.S. attorney who works in terrorism and money-laundering cases, “has concluded her detail” with Mueller. Presumably she will return to the Justice Department until she decides to make gobs of money at a Big Law firm or a compliance consulting firm. Caroline West is coming up on three years as global chief compliance officer for Olympus Corp. The company also just wrapped up a three-year deferred-prosecution agreement and monitorship, so it’s probably beer o’clock Friday there this afternoon.. Customer win: Israel Discount Bank of New York has decided to use NICE Actimize software for its anti-money laundering compliance and investigations function. The U.K. Government Internal Audit Agency is looking for a group chief auditor for UK Research & Innovation. Job is based in Swindon, outside London. VMWare is looking for a director of global compliance risk process, which is a mouthful of a title, but sounds like the job is about designing business processes to comply with anti-corruption law. Based in Silicon Valley. UC Irvine Health is seeking a chief compliance and privacy officer. Job is based in Irvine, Calif.
That’s all for the week ending March 22. As always — if you have a tip or want to brag about your new job, promotion, career milestone, or anything else, email me at [email protected] or find me on LinkedIn. I’m always happy to give credit to the many hard-working people here in our corner of the business universe.